It’s yard sale season which means time to walk, bike or drive around looking for yard and garage sales and buying used items from your neighbourhood. 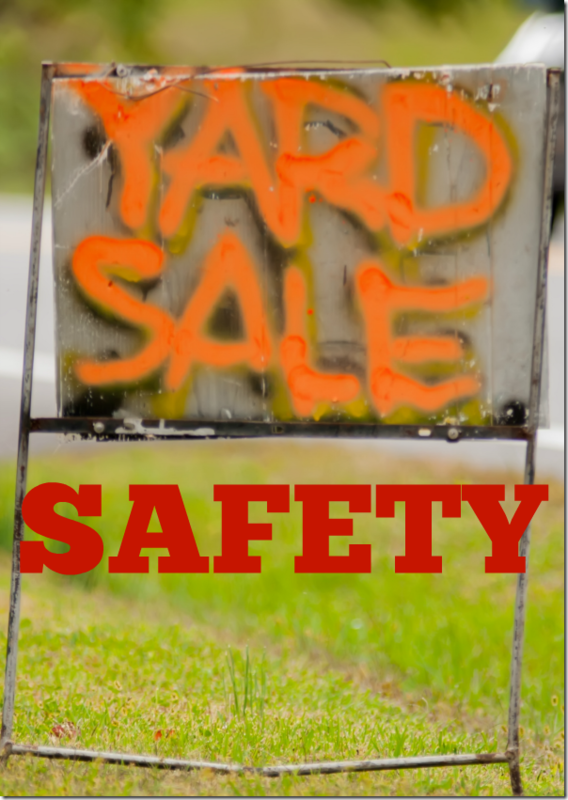 Make sure you keep these Yard Sale Safety Tips in mind. Yard sales can be fun, finding treasures in another person’s trash (okay not literally their TRASH but you know what I mean.) It’s especially fun to find older items that remind you of a time gone by or in some cases, that can be worth money. It’s important to be safe when you go yard sale hunting or even buy something used another way such as a flea market, thrift store or on the internet. Keep these tips in mind for the best experience. Canada – Did You Know? In Canada, It’s the sellers responsibility to make sure items being sold are safe. There are also certain products that are banned in Canada and should not be sold such as baby walkers, infant self-feeding devices, lawn darts with long tips and baby bottles contained BPA. It is illegal to sell or give away the banned items. It is also not advised for you to sell or giveaway a car seat made before January 2012 because of a change in car seat regulations. If you do not live in Canada, please check on the rules and laws where you live. Look over any item you want to buy very well to look for damage or wear and tear. Read labels and if it’s an electronic or appliance, ask for the user manual. If it’s something electronic you should also ask to try it out. Look for broken parts, frayed wires, dents or missing pieces. Sometimes these can just be annoying and other times it can indicate and unsafe item or a waste of money. You should be familiar with what items you really need to be careful of. Pay special attention to baby items (car seats, cribs, bassinets, playpens, strollers) that may not adhere to safety regulations or be dangerous because of age and cosmetics which may be from another country and contain ingredients not allowed in your country or that are just not safe. Old electronics may not be certified and can be a fire hazard.